For this tutorial it is presumed, that you are familiar with procedures, functions, loops, pointers and usual commands of Free Pascal or its dialects. If this is not the case you may face problems because this tutorial deals with the features and usage of the SDL 2.0 library and will not explain basic concepts of Pascal programming. For a quick refresh on some Pascal basics, have a look into this (good) article Modern Object Pascal Introduction For Programmers by Michalis Kamburelis. How to get the source code of examples? You can easily copy the example source code directly from the source code box for each chapter. Hover into the source code box with your mouse cursor, a grey mini menu will show up at the top. Click on the button “Toggle Plain Code” (or just double click into the source code box anywhere). The source code box turns black and white. Copy the full source code (or parts of it) into your compiler’s IDE or a simple text file. To reverse the effect, just again hover into the box and click “Toggle Plain Code” again. The source code is displayed as originally. Feel free to try it out further below, there is a source code box :-). Always include the SDL2 unit in the uses clause. The SDL2 unit is the heart of every SDL 2.0 application! If you do so, you are perfectly prepared to start coding. The different features of SDL 2.0 (screen/video handling, audio handling, keyboard handling, and so on) have to be initilized individually using this function. It will return 0 on success and a negative error code on failure. You may wonder about the variable types SInt32 and UInt32 in the SDL_Init function declaration. Such integer types (which we will see in other chapters again) originate from the original C-language SDL 2.0 code. For an easier translation to Free Pascal they were kept. The S and U mean “signed” (negative values possible) and “unsigned” (values greater or equal zero only), the Int stands for “integer” and the number stands for the bit value. 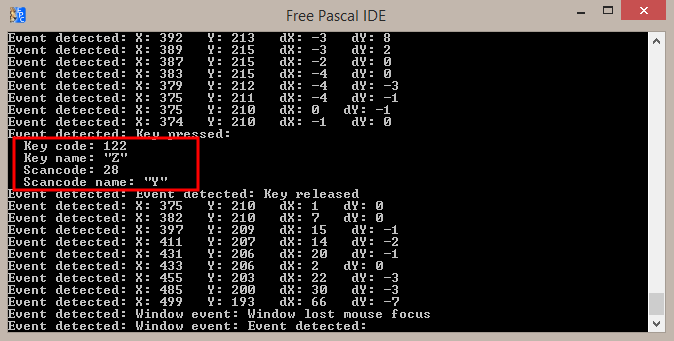 So UInt32 is an 32 bit unsigned integer (which corresponds to Free Pascal’s longword). In the first example we want to initialize the SDL 2.0 video subsystem for screen handling. The following code example shows the frame of a typical SDL 2.0 application. program Chapter3_SDL2; uses SDL2; begin //initilization of video subsystem if SDL_Init( SDL_INIT_VIDEO ) < 0 then HALT; //your SDL2 application/game //shutting down video subsystem SDL_Quit; end. SDL_INIT_TIMER Initilizes timer subsystem for handling of time related events. SDL_INIT_AUDIO Initilizes audio subsystem for playing music or sound effects. 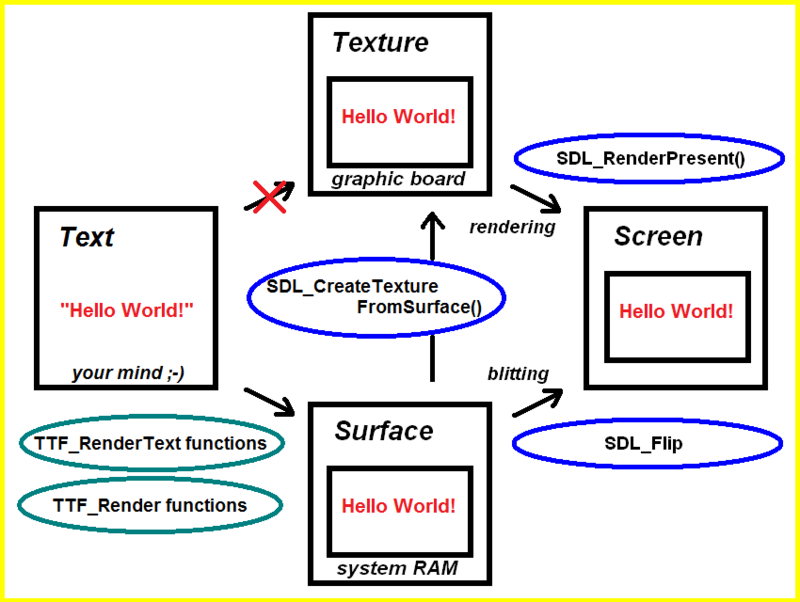 SDL_INIT_VIDEO Initilizes video subsystem for drawing/showing/manipulating of graphics, textures and screen, usually the most important subsystem. SDL_INIT_JOYSTICK Initilizes joystick subsystem for handling of joysticks. SDL_INIT_HAPTIC Initilizes haptic (force feedback) subsystem. SDL_INIT_GAMECONTROLLER Initilizes game controller subsystem. SDL_INIT_EVENTS Initilizes events subsystem for handling of mouse or keyboard input. SDL_INIT_EVERYTHING Initilizes all the subsystems above. SDL_INIT_NOPARACHUTE Ignores fatal signals. In SDL2 this is set by default and it isn’t possible to change this state. The explanation is given in the official migration guide I will cite here:There’s no SDL parachute anymore. What 1.2 called SDL_INIT_NOPARACHUTE is a default and only state now. This would cause problems if something other than the main thread crashed, and it would interfere with apps setting up their own signal/exception handlers. On the downside, some platforms don’t clean up fullscreen video well when crashing. You should install your own crash handler, or call SDL_Quit() in an atexit() function or whatnot if this is a concern. Note that on Unix platforms, SDL still catches SIGINT and maps it to an SDL_QUIT event. respectivly. Again 0 ist returned on success and the negativ error code in case of failure. You are allowed to quit two or more subsystems by this function by using OR operator. It is advised to always quit SDL 2.0 applications by SDL_Quit even if you quit all of them individually by SDL_QuitSubSystem before. Now you can try the example program. You will not see much but if you didn’t get an error message you was successful. Before proceeding, let’s have a quick look into error handling. Every SDL 2.0 function returns an error value for you to check if the function runs properly at runtime. The values returned are of integer or pointer type. There is no general rule what values correspond to which status. In SDL 2.0 usually an integer value of 0 means “function runs/ran succesfully”, values lower than 0 correspond to a status “function couldn’t be run, something is wrong”. For pointers nil means error and any non-nil pointer means success. However, in most cases I won’t do error checking to keep code examples short. I will mention the error values to be expected though. which translates the last error received into a message (of type PAnsiChar) that can be read out and printed to the screen by any function that can handle strings as well (e.g. 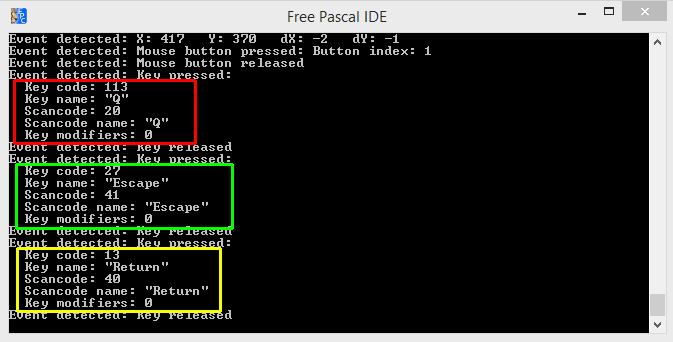 the Pascal’s common write() function). 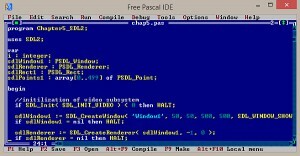 Since SDL 2.0 is written in C originally, the PAnsiChar type is used in contrast to the String type (which is more common among Pascal programmers for message storage and handling). While the flags indicate the reason for the message box, the title and the message argument are used to set a box title and a message. The window argument can be set to the nil pointer. The following short code snippet demonstrates a convenient way of using the box for showing error messages in the case of SDL2 initialization as done above. Well, we have initilized the video subsystem and released it afterwards, and we learned about showing error messages in a simple message box. Simple Directmedia Layer deserves its name, isn’t it? Only if you agree, you may proceed the next chapter ;-)! SDL is the abbreviation of Simple DirectMedia Layer. Originally when refering to SDL, SDL 1.2 was meant. It is the predecessor of modern SDL 2.0 (sometimes SDL2). Nowadays, when refering to SDL, it depends on context if you really mean the old SDL 1.2 or the modern SDL 2.0. The obsolete SDL 1.2 and the modern SDL 2.0 are a set of units which provide a free, easy and platform-independent access to features needed for developing high performance games and applications. This includes easy access to graphic, sound and input handling (keyboard, mouse, joystick) for Free Pascal and other Pascal dialects. 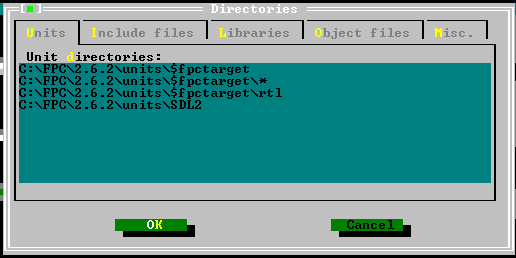 SDL was developed between 1998 and 2001 by Sam Lantinga, the chief programmer of the software company Loki Games. In 2002 the company got bankrupt, but Lantinga went on developing SDL. So it got updated continuously until today. In August 2013 the successor SDL 2.0 has been released. SDL 2.0 introduces a lot of new features which allow development of high performance applications using up-to-date technologies. 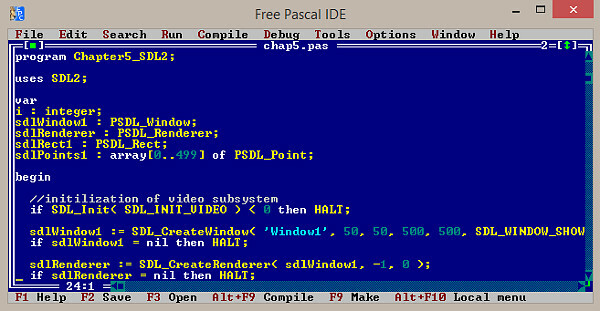 Although the original library isn’t written in Pascal, fortunately the SDL 2.0 headers got translated to Pascal by Tim Blume and others, so the SDL 2.0 library is usable for Pascal developers as well. This page is made to help you to start with the SDL and/or SDL2 (Simple Directmedia Layer) library under Free Pascal (or other Pascal dialects) and to acquaint yourself with SDL’s concepts and commands. Be aware though that my tutorials gives just a brief overview and introduction to the SDL and SDL2 library and are far from being all-embracing. The tutorials aim at Pascal programmers knowing the basic concepts (loops, functions, pointers) of Pascal and now like to progress to SDL and/or SDL2. Displaying of images/sprites/textures as discussed in previous chapters are sometimes accompanied by drawing operations. For some applications and games drawing operations are even essential, e.g. you need to draw buttons of dynamic dimension in your application. Discussion of a more detailed case is found right after the code example. 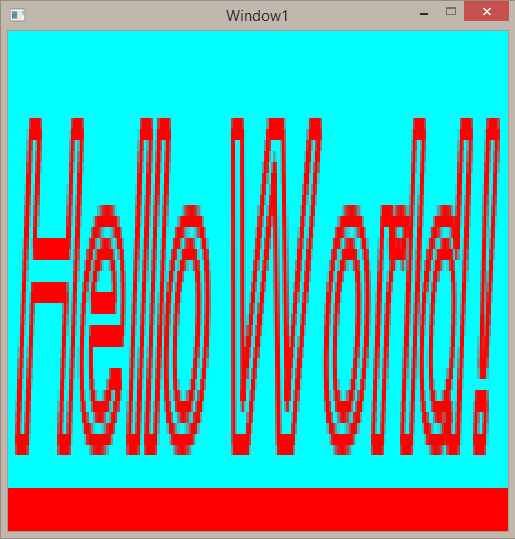 program Chapter5_SDL2; uses SDL2; var i : integer; sdlWindow1 : PSDL_Window; sdlRenderer : PSDL_Renderer; sdlRect1 : PSDL_Rect; sdlPoints1 : array[0..499] of PSDL_Point; begin //initilization of video subsystem if SDL_Init( SDL_INIT_VIDEO ) < 0 then HALT; sdlWindow1 := SDL_CreateWindow( 'Window1', 50, 50, 500, 500, SDL_WINDOW_SHOWN ); if sdlWindow1 = nil then HALT; sdlRenderer := SDL_CreateRenderer( sdlWindow1, -1, 0 ); if sdlRenderer = nil then HALT; SDL_SetRenderDrawColor( sdlRenderer, 0, 255, 255, 255 ); SDL_RenderClear( sdlRenderer ); SDL_RenderPresent ( sdlRenderer ); SDL_Delay( 1000 ); SDL_SetRenderDrawColor( sdlRenderer, 255, 0, 0, 255 ); SDL_RenderDrawLine( sdlRenderer, 10, 10, 490, 490 ); SDL_RenderPresent( sdlRenderer ); SDL_Delay( 1000 ); SDL_SetRenderDrawColor( sdlRenderer, 0, 0, 0, 255 ); for i := 0 to 47 do SDL_RenderDrawPoint( sdlRenderer, 490-i*10, 10+i*10 ); SDL_RenderPresent( sdlRenderer ); SDL_Delay( 1000 ); new( sdlRect1 ); sdlRect1^.x := 260; sdlRect1^.y := 10; sdlRect1^.w := 230; sdlRect1^.h := 230; SDL_SetRenderDrawColor( sdlRenderer, 0, 255, 0, 255 ); SDL_RenderDrawRect( sdlRenderer, sdlRect1 ); sdlRect1^.x := 10; sdlRect1^.y := 260; SDL_SetRenderDrawBlendMode( sdlRenderer, SDL_BLENDMODE_BLEND ); SDL_SetRenderDrawColor( sdlRenderer, 0, 0, 255, 128 ); SDL_RenderFillRect( sdlRenderer, sdlRect1 ); SDL_RenderPresent( sdlRenderer ); SDL_Delay( 1000 ); randomize; for i := 0 to 499 do begin new( sdlPoints1[i] ); sdlPoints1[i]^.x := random(500); sdlPoints1[i]^.y := random(500); end; SDL_SetRenderDrawColor( sdlRenderer, 128, 128, 128, 255 ); SDL_RenderDrawPoints( sdlRenderer, sdlPoints1, 500 ); SDL_RenderPresent( sdlRenderer ); SDL_Delay( 3000 ); for i := 0 to 499 do dispose( sdlPoints1[i] ); dispose( sdlRect1 ); SDL_DestroyRenderer( sdlRenderer ); SDL_DestroyWindow ( sdlWindow1 ); //shutting down video subsystem SDL_Quit; end. Wow, that looks like a big load of new functions, but I promise, drawing in SDL 2.0 is very simple. What the executed program will look like is shown in the following screenshot. Now, let’s have a closer look to the first lines of code. The program is called “Chapter5_SDL2”. We will need a counter variable “i” of native Pascal type integer later. We need a window and a renderer and call them “sdlWindow1” and “sdlRenderer” as known from the previous chapters. Next we declare a variable “sdlRect1” which is of type PSDL_Rect (not TSDL_Rect this time). The same is true for “sdlPoints1” which is an array of 500 elements of type PSDL_Point. If you have a large amount of points or rectangles, it is usually better to use the pointer types because they will be stored in the heap. Nothing new here, we initilize SDL 2.0, create a window with 500 pixels width and 500 pixels height and associate the renderer with this window. Now we have something new here, SDL_SetRenderDrawColor() sets a colour for drawing operations, just as if you choose for a pencil colour to draw something. This function doesn’t draw anything though. It returns 0 on success and the negative error code on failure. First you need to set the renderer for which this drawing colour is meant. After that you have to set the colours red, green, blue and the alpha value. They can range from 0 to 255 (integer values only). Think in terms of 255 being 100% and 0 being 0% of that colour or the alpha value. As a start let’s neglect the alpha value. If you like to have a red colour, you need to set the value for the red colour high, e.g. 100%, the maximum value is 255, and since you don’t want to mix in green and blue, they get the minimum value of 0 (hence 0%). Setting up red therefore corresponds to 255/0/0 in terms of r/g/b. For comparision, 0/255/0 will lead to green, 255/255/255 is white and 0/0/0 is black, and so on. In the example code we used 0/255/255 which leads to cyan (mixing up green and blue additively). With these three values you can generate every colour possible. So what is the meaning of the alpha value then? Well, it determines the transparency. 255 means fully opaque and 0 means full transparency. This is very important for blend effects in computer graphics and will be demonstrated later on in the code. By the way, instead of 255 you could use SDL_ALPHA_OPAQUE. If you count the alpha value also as colour variation you have 4.29 billion different possibilities. The function SDL_RenderClear() is for clearing the screen with the drawing colour. As argument you just need to tell the renderer. It is simple as that :-). Since we set the drawing colour to cyan before, the screen will be cleared with a cyan colour. This function will return 0 on success and a negative error code on failure. The cleared screen will be shown for one second by SDL_RenderPresent() and SDL_Delay(). These two procedures are known from the previous chapter. Now we change the drawing colour by SDL_SetRenderDrawColor() to red and use SDL_RenderDrawLine() to draw a simple line. Again you need the renderer, which is “sdlRenderer” in our case. After that you specify the x/y coordinates where the line should begin and then the x/y coordinates where the line should end. Remember that the origin 0/0 is at the top left corner of the window. The coordinates 10/10 mean to start at the point ten pixels to the right and ten pixel to the bottom relative to the origin. Thus, the coordinates 490/490 for the second point will lead to a diagonal line across the window. This function returns 0 on success and a negative error code on failure. After that again we ask to render this line to the screen by SDL_RenderPresent() and wait one second by SDL_Delay(). Now we change the colour to black and draw some points by the function SDL_RenderDrawPoint(). It is nearly identical to SDL_RenderDrawLine() but instead of four coordinates you need just two coordinates where the point should be drawn. This function returns 0 on success and the negative error code on failure. I thought it would be nice to have more than just one point to be drawn, so the function is used in a for-loop to draw altogether 48 points. Here we need the counter variable “i”. Maybe you can guess from the code where the points are and how they are arranged, if not, just run the code ;-). Finally the result is rendered to the screen by SDL_RenderPresent() and the program waits one second by SDL_Delay(). Let’s proceed to the next chunk of code now. 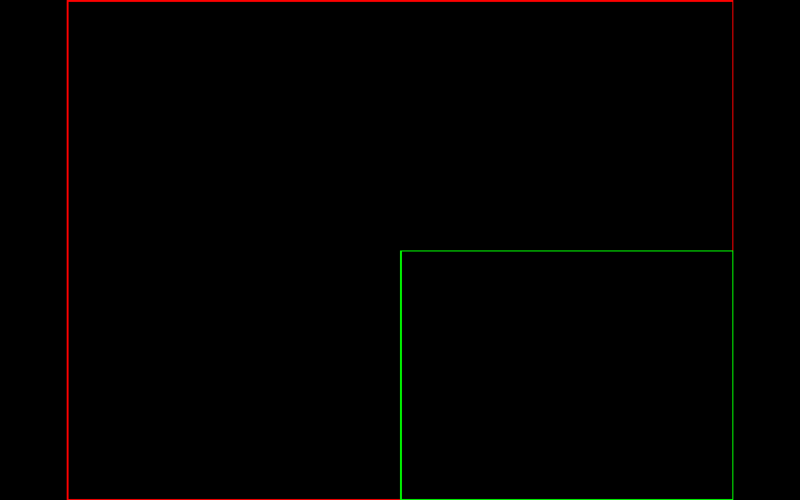 The drawing colour is set to green by SDL_SetRenderDrawColor() and the rectangle is drawn by SDL_RenderDrawRect(). The renderer and the rectangle of type PSDL_Rect are the parameters of this function. So we use “sdlRenderer” and “sdlRect1” again to draw the rectangle. This function returns 0 on success and the negative error code on failure. First the renderer for which the blend mode has to be set is chosen. In our case it is “sdlRenderer” again. Then there are four blend modes available. Their description is taken from the official SDL 2.0 Wiki. We are looking for alpha blending, so we use SDL_BLENDMODE_BLEND as argument for the blend mode. This function returns 0 on success and the negative error code on failure. After doing so the result is rendered to the screen by SDL_RenderPresent() and shown for one second by SDL_Delay(). Both rectangles, the green one and the half-transparent blue one appear at the same time. 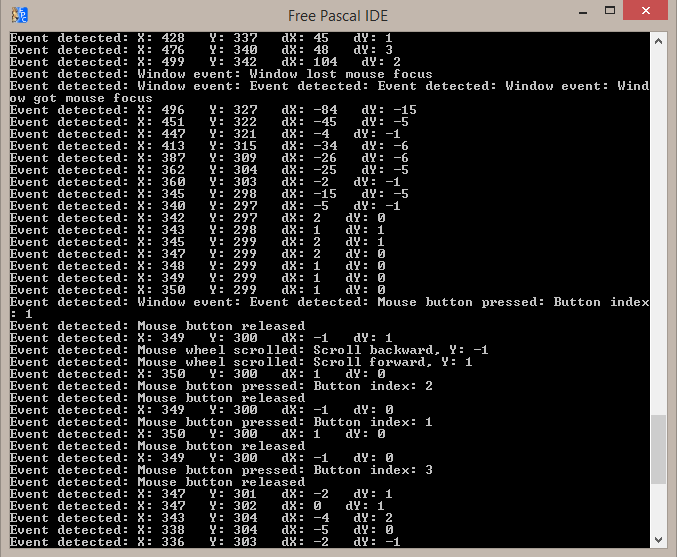 randomize is a Free Pascal procedure to initilize the random number generator. Imagine this as shaking the dice. As expected, the PSDL_Point record has two values, the x/y coordinates of the point. Free Pascal’s random() function generates random numbers between 0 and the number which is used as argument substracted by one. So we generate 500 times a random x and y value between 0 and 499 and save them into the 500 SDL_Point records. A grey colour is set by SDL_SetRenderDrawColor() for the points. 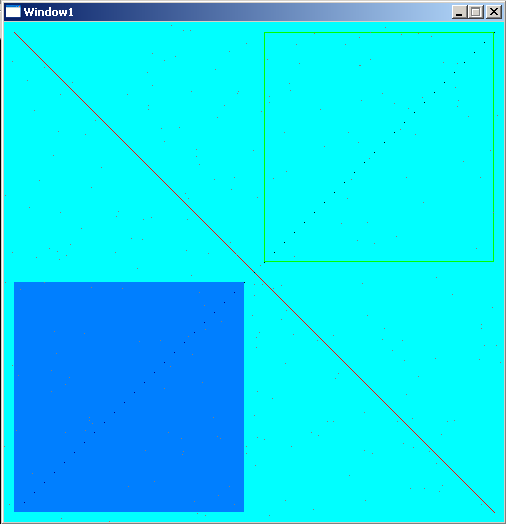 To draw the points in the array “sdlPoints1” we use SDL_RenderDrawPoints(). As a hint, I had troubles using SDL_RenderDrawLines, I expected them to connect one point by another with lines to get kind of a polygon structure but instead the points just draw vertical lines to the bottom. Seems to me like a bug. for i := 0 to 499 do dispose( sdlPoints1[i] ); dispose( sdlRect1 ); SDL_DestroyRenderer( sdlRenderer ); SDL_DestroyWindow ( sdlWindow1 ); //shutting down video subsystem SDL_Quit; end. Finally all the memory reserved for points, the rectangle, the renderer and the window is free’d and SDL 2.0 shut down by SDL_Quit. Congratulations, you just finished this chapter :-). below, or you may directly skip to the next chapter . 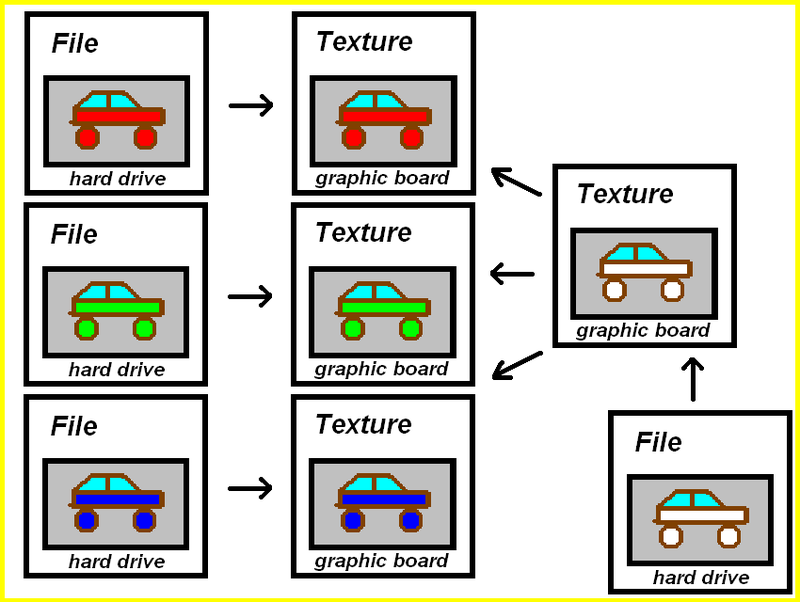 1) You create several images with differently coloured cars and store them on your harddrive. This is perfectly okay if you have a small number of cars (and colours) to be chosen. But what if you want the player to choose from a large variety of colours, 100 colours or more, or what if you want to let the player to choose the colour of his car by himself? Notice, in case of 16 bit colouring that means 65536 possibilities after all! Would you want to create that many images? In case of 32 bit colouring you have fantastic 4.29 billion colours!! Amazing, but you will never be able to create so many images in just one human being’s life. Furthermore, this would take up a lot of hard drive memory (4.29 billion times the file size of the car image) for just a simple car racing game. Look at the following image. It contains the discussed method from left to the middle. On the right to the middle is the solution :-). 2) You create one template image on your harddrive and colour it during runtime of the program. This is just one example where drawing is very helpful. The colour is composed of four components, RGBA, that is red, green, blue and the alpha value. The physical screen consists of many small units. Every unit itself consists of three different coloured lights. These colours are red, green and blue. If you mix them up, you can get every other colour. These colours are mixed up additively. For example if you mix red and green you get yellow. For three colours that can be mixed with each other, there are eight combinations possible which lead to different colours (RGB, RG, RB, R, GB, G, B, all lights off). If you mix red, green and blue (all lights on, RGB), you get white, and if all lights are off, you get black. Some may say, white and black are no colours at all. Well, that is right but doesn’t matter here and to keep simpliness I will talk of colours even if I talk of black and white. Your screen definitvly has more than eight colours, doesn’t it? The reason is, your screen isn’t just able to switch lights on or off. Besides it is able to differ the intensities of the lights. The more intensity levels you have the more colours you can display. The case that you have eight colours as discussed before means that you just have one intensity level, on or off. If your screen is in 8 bit mode every pixel on the screen has the possibility to display 2 power 8 colours. That are 256 different colours. Every of the three lights has therefore a certain amount of different light intensity levels. If you have 16 bit mode you have 2 power 16 and that are 65536 colours. Each light therefore has the appropriate amount of intensity levels. Since we prefer 32 bit mode, we have 4.29 billion different colours! This is part 2 of the chapter about event handling. Mouse and window handling is treated here. program Chapter8_SDL2; uses SDL2; var sdlWindow1: PSDL_Window; sdlEvent: PSDL_Event; exitloop: boolean = false; text1: string = ''; begin //initilization of video subsystem if SDL_Init( SDL_INIT_VIDEO ) < 0 then HALT; sdlWindow1 := SDL_CreateWindow( 'Window1', 50, 50, 500, 500, SDL_WINDOW_SHOWN ); if sdlWindow1 = nil then HALT; new( sdlEvent ); while exitloop = false do begin while SDL_PollEvent( sdlEvent ) = 1 do begin write( 'Event detected: ' ); case sdlEvent^.type_ of //keyboard events SDL_KEYDOWN: begin writeln( 'Key pressed:'); writeln( ' Key code: ', sdlEvent^.key.keysym.sym ); writeln( ' Key name: "', SDL_GetKeyName( sdlEvent^.key.keysym.sym ), '"' ); writeln( ' Scancode: ', sdlEvent^.key.keysym.scancode ); writeln( ' Scancode name: "', SDL_GetScancodeName( sdlEvent^.key.keysym.scancode ), '"' ); writeln( ' Key modifiers: ', sdlEvent^.key.keysym._mod ); case sdlEvent^.key.keysym.sym of 27: exitloop := true; // exit on pressing ESC key //switching text input mode on/off SDLK_F1: begin if SDL_IsTextInputActive = SDL_True then SDL_StopTextInput else SDL_StartTextInput; writeln(' Text Input Mode switched' ); end; end; end; SDL_KEYUP: writeln( 'Key released ' ); SDL_TEXTINPUT: begin writeln( 'Text input: "', sdlEvent^.text.text, '"' ); text1 := text1 + sdlEvent^.text.text; writeln( 'Full string: ' + text1 ); end; //mouse events SDL_MOUSEMOTION: begin writeln( 'X: ', sdlEvent^.motion.x, ' Y: ', sdlEvent^.motion.y, ' dX: ', sdlEvent^.motion.xrel, ' dY: ', sdlEvent^.motion.yrel ); end; SDL_MOUSEBUTTONDOWN: writeln( 'Mouse button pressed: Button index: ', sdlEvent^.button.button ); SDL_MOUSEBUTTONUP: writeln( 'Mouse button released' ); SDL_MOUSEWHEEL: begin write( 'Mouse wheel scrolled: ' ); if sdlEvent^.wheel.y > 0 then writeln( 'Scroll forward, Y: ', sdlEvent^.wheel.y ) else writeln( 'Scroll backward, Y: ', sdlEvent^.wheel.y ); end; //window events SDL_WINDOWEVENT: begin write( 'Window event: ' ); case sdlEvent^.window.event of SDL_WINDOWEVENT_SHOWN: writeln( 'Window shown' ); SDL_WINDOWEVENT_MOVED: writeln( 'Window moved' ); SDL_WINDOWEVENT_MINIMIZED: writeln( 'Window minimized' ); SDL_WINDOWEVENT_MAXIMIZED: writeln( 'Window maximized' ); SDL_WINDOWEVENT_ENTER: writeln( 'Window got mouse focus' ); SDL_WINDOWEVENT_LEAVE: writeln( 'Window lost mouse focus' ); end; end; end; end; SDL_Delay( 20 ); end; dispose( sdlEvent ); SDL_DestroyWindow ( sdlWindow1 ); //shutting down video subsystem SDL_Quit; end. If you got the basic concept of event handling, you will find that mouse handling and keyboard handling have a lot in common. For mouse motions, mouse buttons and the mouse wheel there are three different mouse event structures: SDL_MouseMotionEvent, SDL_MouseButtonEvent and SDL_MouseWheelEvent. Again there are the type_, the timestamp and the windowID fields. Nothing new here. The field which contains the mouse id. This is important if you have more than one mouse device attached to your computer. Think for example of a laptop with a touchpad area to move the mouse cursor and at the same time there is an usb mouse attached to the laptop. To distinguish between the two, you may retrieve their id’s. The state field is known from the SDL_KeyBoardEvent structure. It may be a difference if you have a mouse button pressed and move the mouse or if you don’t have a button pressed. The most famous example is if you want to select a bunch of files on your desktop or in a folder. By the way, the state field encodes a number which is different depending on which buttons you pressed actually. This works similar to the key modifiers, if you keep two mousebuttons pressed while moving, the state is the sum of each individual mouse button state value. As an example for my mouse: No mouse button 0, left mouse button 1, right mouse button 4, middle mouse button 2, thumb button 8. If I keep pressed left and right mouse button 5 (sum 1 + 4). The x and y fields contain the coordinate of the mouse cursor in pixels. These coordinates are relative to the window of the SDL 2.0 application. Keep in mind, the coordinates (0/0) correspond to the left upper corner. Positive x values are counted from left to right and positive y values are counted from top to bottom. The fields xrel and yrel are used to determine how fast the mouse has been moved from one point to another. Let’s assume you move the mouse surcor from left to right in your application’s window. The first time you do it slowly, xrel might be 1, means, you just moved pixel from left to right between two mouse motion events. If you move fast, xrel might be 50, meaning that this time you moved by 50 pixels between two mouse motion events. Especially for game programming this can be a extremely important information. E.g., think of first person shooter, if the movement speed of the first person view would be independent of the actual movement of the mouse, this game wouldn’t make much sense. and simply printed out to the screen. Let’s go for the next chunk of code. If you compare this structure to the structure of the SDL_MouseMotionEvent, you will find, only the two field xrel and yrel are gone and a new field, a crucial one to be clear, is new, which is button of 8 bit unsigned integer type. I won’t discuss all the fields again we discussed for the SDL_MouseMotionEvent structure. Attention, if you compare the state field of the SDL_MouseButtonEvent, it works another way. It allows just for two values, SDL_PRESSED or SDL_RELEASED, as known from SDL_KeyBoardEvent. As a reminder: For the SDL_MouseMotionEvent, it represented that full state of all the buttons being pressed while mouse motion. You see, to access the fields of this record you need to address the event’s button field. This mustn’t be confused with SDL_MouseButtonEvent’s button field discussed above. If the mouse wheel is used a SDL_MOUSEWHEEL event is triggered. Let’s look into the corresponding SDL_MouseWheelEvent structure. New fields here are the x and y field which do not correspond to the mouse cursor position this time. Instead of that they refer to the direction of the mouse wheel being scrolled. If you scroll the mouse wheel upwards or forward it will return 1, and if you scroll it backwards it will return -1. If you have a mouse wheel which can be scrolled horizontally, it will be similar. By the way scrolling a mouse wheel can be considered as pressing a button very quickly for that direction. In the code, if a SDL_MOUSEWHEEL event is triggered, the y value is checked to be positive or negative. This decides if an upward or downward scrolling has happened and the corresponding value (1 or -1) will be returned and printed out. Anyway, could you guess what happens if anyone would use a mouse wheel that is scrolling horizontally? – The same block will be executed since a SDL_MOUSEWHEEL event is triggered. Instead of y being 1 or -1, it will be 0 but the x value will be 1 or -1. Nevertheless, the else-block will be executed since y is not greater than 0. So for the example program it will print out wrongly that an backward scroll has happened. Anyway, you get the idea. Modern applications are always run in windows. The famous operation system “Windows” by Microsoft even derived it’s name from this. 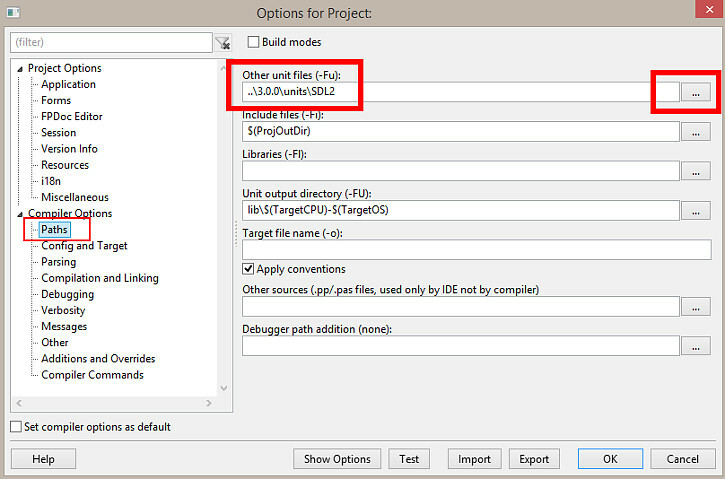 The first task for most of SDL 2.0 applications is the creation of a window. The example code creates a window of width 500 pixels and height 500 pixels. It may be important to know if the user interacts with the application window. Whenever this happens a SDL_WINDOWEVENT is triggered. If the an event of type SDL_WINDOWEVENT is triggered, the text message “Window event: ” is printed out. To access the window event fields, you need to access the event’s window field. The field event contains the window event’s type information, hence what window event has been triggered. In contrast to the keyboard and the mouse event we discussed before, the different event types are not distinguished by the type_ field but by an additional field event. In the example code six different window event types are checked: SDL_WINDOWEVENT_SHOWN, SDL_WINDOWEVENT_MOVED, SDL_WINDOWEVENT_MINIMIZED, SDL_WINDOWEVENT_MAXIMIZED, SDL_WINDOWEVENT_ENTER and SDL_WINDOWEVENT_LEAVE. From the texts printed out you can guess when they get triggered. I think no further explanation is needed here. By the way, there are more window event types which are shown a little bit later. Sometimes if one of these is triggered, only the text that a window event has been triggered is shown but without any further details since the example code doesn’t covers further treatment. Feel free to extent the code yourself. Let’s have a look at the event structure of SDL_WindowEvent. The fields type_, timestamp and windowID are known and have the same meaning as discussed before. This list is based upon information found at the SDL 2.0 wiki. If you read through the list carefully you will notice the mention of data1 and data2 which rather explains their occurance in the event structure :-)! They need to be read out for SDL_WINDOWEVENT_MOVED and SDL_WINDOWEVENT_RESIZED to get the new window position or dimensions. At the moment I’m not sure why for window events the distinction between the individual window events (e.g. SDL_WINDOWEVENT_MOVED, SDL_WINDOWEVENT_RESIZED, and so on) is not done by the type_ field as for keyboard, mouse and other events, but rather by the additional event field. Not much to learn in the final part. The loop is delayed by 20 milliseconds for better recognizability of the text output. If the loop is left, the event pointer gets free’d, the SDL 2.0 window gets destroyed and SDL 2.0 quit. That’s it :-)! Touchscreen events, Joystick events and many more! This chapter covered keyboard, mouse and window events in some detail. Keep in mind, SDL 2.0 has much more to show! – There are many more events you can use for application development. They basically cover any modern type of interaction you could wish for. This includes touchscreen events (important for smartphone development), joystick events (game console development), and even a dropfile event (drag and drop files) and more. What’s an event and event handling in programming? Event handling is a major concept in game and application programming. It allows for the user to interact with your program. Whenever you move your mouse cursor, press or release a key on the keyboard or use a touch screen, all these interactions are recognized as so-called events. In SDL 2.0 whenever an event occurs, for instance a key gets pressed on the keyboard, all the information related to that specific event is stored in a SDL_Event record. Depending on the event type (e.g. mouse motion, key pressed on a keyboard, maximizing the application window) there are very different fields which can be accessed. For a mouse motion you can read out the x and y position of the cursor whereas there is no sense in having x and y values for a pressed key on the keyboard, but to know which specific key has been pressed on the keyboard. There are many more types of events than a mouse motion and a key being pressed on a keyboard. Think of using a joystick, using a touchscreen, minimizing/maximizing the application window, and so forth. There are plenty of different events that could occur. This list is overwhelmingly long but don’t worry, as soon as you get the concept behind events you will easily understand which of these event types will play a role for the applications you like to develop. The most important events are covered by this tutorial in detail anyway. You will be able to work with the remaining events once you got the concept. In contrast to SDL 1.2 there are some event types gone and many new types available in SDL 2.0 which are useful to use new forms of interaction between the user and the application (e.g. touch screen technology). What is the difference between event type, event structure and the event field? In the table above you’ll notice the first column covers the event type. It determines which type of event occured, e.g. a key is pressed down on the keyboard (SDL_KEYDOWN). The event structure in the second column is the record structure which is dependend upon the event type. As discussed before, a pressed key will need a record structure which stores the key identifier rather than x,y-coordinated (which would in turn be necessary for a mouse motion). Each event type has a certain apropriate (event) record structure to hold the event information. Many event types can share the same event structure. The event types SDL_KEYDOWN and SDL_KEYUP which are generated by pressing or releasing a key share the same event structure SDL_KeyboardEvent since the information are the same, e.g. the key identifier. The third column shows the SDL_Event field name to access the event specific fields. In case of an event type SDL_KEYDOWN the event structure is SDL_KeyboardEvent. The specific information, e.g. the key identifier, is accessible via the field key in the SDL_Event record. This may sound confusing. Later on the relation is discussed in more detail. Let’s right proceed into the code. program Chapter8_SDL2; uses SDL2; var sdlWindow1: PSDL_Window; sdlEvent: PSDL_Event; exitloop: boolean = false; text1: string = ''; begin //initilization of video subsystem if SDL_Init( SDL_INIT_VIDEO ) < 0 then HALT; sdlWindow1 := SDL_CreateWindow( 'Window1', 50, 50, 500, 500, SDL_WINDOW_SHOWN ); if sdlWindow1 = nil then HALT; new( sdlEvent ); while exitloop = false do begin while SDL_PollEvent( sdlEvent ) = 1 do begin write( 'Event detected: ' ); case sdlEvent^.type_ of //keyboard events SDL_KEYDOWN: begin writeln( 'Key pressed:'); writeln( ' Key code: ', sdlEvent^.key.keysym.sym ); writeln( ' Key name: "', SDL_GetKeyName( sdlEvent^.key.keysym.sym ), '"' ); writeln( ' Scancode: ', sdlEvent^.key.keysym.scancode ); writeln( ' Scancode name: "', SDL_GetScancodeName( sdlEvent^.key.keysym.scancode ), '"' ); writeln( ' Key modifiers: ', sdlEvent^.key.keysym._mod ); case sdlEvent^.key.keysym.sym of SDLK_ESCAPE: exitloop := true; // exit on pressing ESC key //switching text input mode on/off SDLK_F1: begin if SDL_IsTextInputActive = SDL_True then SDL_StopTextInput else SDL_StartTextInput; writeln(' Text Input Mode switched' ); end; end; end; SDL_KEYUP: writeln( 'Key released ' ); SDL_TEXTINPUT: begin writeln( 'Text input: "', sdlEvent^.text.text, '"' ); text1 := text1 + sdlEvent^.text.text; writeln( 'Full string: ' + text1 ); end; //mouse events SDL_MOUSEMOTION: begin writeln( 'X: ', sdlEvent^.motion.x, ' Y: ', sdlEvent^.motion.y, ' dX: ', sdlEvent^.motion.xrel, ' dY: ', sdlEvent^.motion.yrel ); end; SDL_MOUSEBUTTONDOWN: writeln( 'Mouse button pressed: Button index: ', sdlEvent^.button.button ); SDL_MOUSEBUTTONUP: writeln( 'Mouse button released' ); SDL_MOUSEWHEEL: begin write( 'Mouse wheel scrolled: ' ); if sdlEvent^.wheel.y > 0 then writeln( 'Scroll forward, Y: ', sdlEvent^.wheel.y ) else writeln( 'Scroll backward, Y: ', sdlEvent^.wheel.y ); end; //window events SDL_WINDOWEVENT: begin write( 'Window event: ' ); case sdlEvent^.window.event of SDL_WINDOWEVENT_SHOWN: writeln( 'Window shown' ); SDL_WINDOWEVENT_MOVED: writeln( 'Window moved' ); SDL_WINDOWEVENT_MINIMIZED: writeln( 'Window minimized' ); SDL_WINDOWEVENT_MAXIMIZED: writeln( 'Window maximized' ); SDL_WINDOWEVENT_ENTER: writeln( 'Window got mouse focus' ); SDL_WINDOWEVENT_LEAVE: writeln( 'Window lost mouse focus' ); end; end; end; end; SDL_Delay( 20 ); end; dispose( sdlEvent ); SDL_DestroyWindow ( sdlWindow1 ); //shutting down video subsystem SDL_Quit; end. The result will not be seen in the actually SDL 2.0 window but in the command line window (which usually is showing up along with the SDL 2.0 window on Windows environments). The program is called “Chapter8_SDL2”. Since event handling is a basic feature of SDL 2.0, no further units except for SDL2 itself necessary. We need three variables. 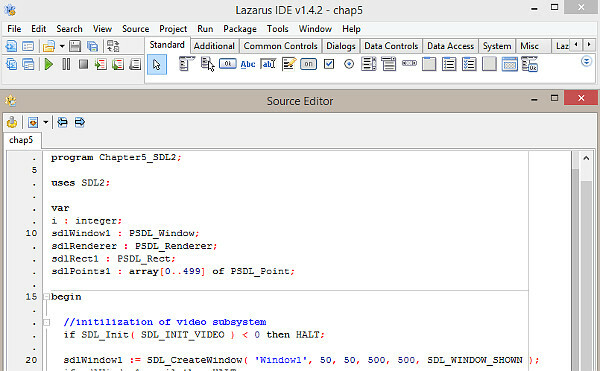 “sdlWindow1” is necessary to create a window as known from previous chapters. This time we won’t draw anything to it but use it to recognize events (e.g. mouse clicks into the window). The SDL_Event variable “sdlEvent” stores the events generated by the user of the application. It is of pointer type PSDL_Event. Then there is a simple Pascal boolean variable “exitloop” which is set to false since we don’t want to leave the program loop initially. Also we have a “text1” string variable we will need to demonstrate text input later. Nothing new for the following lines, SDL 2.0 is initilised and the SDL 2.0 window is created. Since “sdlEvent” is a pointer type variable we need to allocate some memory. This is done by the new command, as known. Within the outer loop the first thing is to poll for an event, which is done by function SDL_PollEvent. This function returns integer value 1 if one or more events are in the queue. The event data is allocated to the SDL_Event variable and deleted from the queue. If there are no events waiting, it returns 0 and the event variable is filled with nil instead of specific event data. If there is an event waiting, its information are fed to “sdlEvent” and 1 is returned. The inner while loop is running until all events in the queue are treated. This will print out a text saying “Event detected” and, more important, check for the event type! Don’t use an if-clause (instead of the inner while loop) to check for the events because that means we only check once a event each every cycle of the outer loop. By combining two while loops and check for all the events in the inner loop we can treat every event occured for this program loop cycle. The event type can be read out from the field type_, hence we check for the type in sdlEvent^.type_ by a case-statement. If _type is a SDL_KEYDOWN event a begin-end block is entered. There are several writeln output lines. Let’s discuss them one after another. Let’s try to break this down a little bit. The event is stored in sdlEvent which is of pointer type so to access the content we need sdlEvent^. In the keyboard event there is a field keysym which itself is a record. The SDL virtual key code is stored in the field sym of the keysym record. Don’t worry if this sounds kind of confusing, in the next part we treat these two records (SDL_KeyboardEvent record and keysym record) in detail. This is not shown in the code though. function SDL_GetScancodeFromName(const name: PAnsiChar): TSDL_ScanCode. The tutorial code returns these key- and scancodes for the “Q”-key, the escape key and the return key. As you can see the codes do not only differ between different keys but also for the same key, e.g. the key code for the escape key is 27 but the scanscode is 41. Anyway, the key names seems to be consistent. Later we will see an example where even the names differ. The last line returns the code value of key modifiers. Key modifiers are keys which literally modify them. E.g., if you press a letter key while holding the shift key, usually you modify the letter to be the capital letter. Typical key modifiers are shift, ctrl and alt. The field which stores the key modifier value is called _mod. Later we will discuss this field more in detail. We check for the value of the key code by a case-statement with sdlEvent^.key.keysym.sym. If we know the key code of a certain key, we may check for this key and react accordingly. First, we check if the event’s key code is SDLK_ESCAPE since this is the key code of the escape key (ESC). If so, the variable exitloop is set to true to stop the outer while loop and exiting the program. In the fifth row the escape key key code is found. In this table you find additionally to the decimal value, the hexadecimal value. You may try to use $001B instead of 27. This will do the trick either :-)! Also there is a character representation shown if possible. If the the F1-key is pressed we would like to turn on or off the text input mode. This time we do not use a decimal key code to recognize the key but rather a constant representation (SDLK_F1). You could guess you have the choice and could use either the decimal value, the constant representation (what about SDLK_ESCAPE in the case before?) or the hexadecimal representation. – SDLK_ESCAPE even exists(!) but guess what, that doesn’t work. For some special keys this works like shown for the F1-key, for most of the other keys it doesn’t work (you will find that most keys are stored as string constants so the compiler will complain that they are of wrong type). So for most keys you have to look up the decimal representation and do as shown. Finally a short text is returned which states that the Text input mode has been changed. More about the input mode later. Last but not least, if _type is a SDL_KEYUP event, we know a key has been released, hence it physically moves up on the keyboard. We just print out “Key released”, we don’t care what exactly key is released here. type_ is an unsigned 32 bit integer (hence UInt32) value which determines what exact type of event you have. As usual the integer values are represented by constants, here SDL_KEYDOWN (if pressed down) and SDL_KEYUP (if key has been released). They share the same overall event record structure (SDL_KeyboardEvent). As a sidenote, all the SDL 2.0 events have a type_ field for obvious reason. The next field timestamp obviously contains a timestamp of integer type which is used internally by SDL 2.0 to resolute the sequence in which all the events were triggered. All SDL 2.0 events have the timestamp field. The windowID field is necessary to distinguish between events raised from different SDL 2.0 windows if there is more than one. Let’s assume your program has two SDL 2.0 windows, window1 and window2. These two windows have certain constant id’s allocated by SDL 2.0. Now, if you have the focus on window1 (meaning the active window is window1) and press a key, the event’s windowID contains the specific id for window1. If the active SDL 2.0 window is window2 and you press a key, the specific id of window2 will be present in windowID. This way you can easily distinguish for which window the program should react to the keyboard event, e.g. a pressed key. Anyway, the capability to handle more than one window has been introduced by SDL 2.0, so you can imagine that for many programs and if you do not have more than one window in your program, you may ignore this field. The windowID field isn’t present (and necessary) for all the events SDL 2.0 provides. The 8 bit integer state field may be read out to get the state of the key (pressed or release) which are encoded by SDL_PRESSED and SDL_RELEASED. You may be a little bit confused what the difference between the pair SDL_PRESSED and SDL_RELEASED and the pair SDL_KEYDOWN and SDL_KEYUP is. Essentially they have the same meaning for a key of a keyboard. Formally, the difference is that SDL_KEYDOWN and SDL_KEYUP are two different event types whereas SDL_PRESSED and SDL_RELEASED are two different key states. In the case of a pressed key on a keyboard the state is kind of redundant because if you get a SDL_KEYDOWN event you already know that a key was pressed and to read out the state (which will be SDL_PRESSED) is unnecessary. Anyway, the state field seems to be introduced for completeness, since for other event types (e.g. mouse events) there is a huge difference if you move the mouse and have mouse buttons pressed or released. _repeat let’s you know if the corresponding key is in repeat mode. For most operation systems the repeat mode kicks in after a short delay when you keep a key pressed. You may try out to open up a simple text editor. If you press any key that has a letter (e.g. “a”-key), in the text editor you will see an “a”. If you keep the key pressed after a short delay the repeat mode kicks in and rapidly several further a’s are coming up. If you are in repeat mode for a certain key, repeat_ has a value different from 0 (most likely 1) and otherwise it will be 0. Especially for games, you may want to turn off the initial delay if you keep a key pressed and let the constant repeat mode kick in without delay. In SDL 1.2 I described here how to do it simply by using function called SDL_EnableKeyRepeat, this function is obsolete and does not exist in SDL 2.0 anymore! A simple solution to the “repeat-delay”-problem: Instead of looking for the actual event being repeatedly triggered by an key event, use a switch which gets turned on if the key down event is occuring and which is turned off if the key up event is occuring. Example: Let’s assume you have a spaceship which should move left on pressing the “a”-key. Instead of changing it’s coordinates only once when the key down event is triggered, you start a switch (e.g. MoveSpaceshipLeft := true). The trigger is treated independently of the events treatment somewhere in the main game loop. As soon as the key up event is triggered for the “a”-key, the switch is turned off (e.g. MoveSpaceshipLeft := false). I don’t know about meaning of the fields padding2 and padding3. Maybe they are kind of place holders for future developments or used internally. As you can see the first two fields contain keycode representations for identitifcation of the key pressed or released. Even though both fields seem to have again special records, namely SDL_ScanCode and SDL_KeyCode, they actually consist of only one field each, DWord (integer type) for SDL_ScanCode and SInt32 (integer type) for SDL_KeyCode. The difference is that the scancode refers to a specific physical location of a key on the keyboard. The scancode is referenced to the typical US keyboard layout (QWERTY layout). The term “QWERTY” just refers to the the first six letters from left to right in the first row with letters on a typical US keyboard. For example: The German keyboard layout (QWERTZ layout) is similar to the US one (for most of the letter keys), though the “Y”-key and the “Z”-key have exactly opposite positions (hence QWERTZ for the German layout in contrast to QWERTY for the US layout). If I press the “Z” key on the German keyboard, the returned scancode will represent the “Y” key since the position of the key (independent of the layout) is equal to the position of the “Y” key on an US keyboard. Scancodes are layout-independent. The key code refers to the virtual representation of the key according to the keyboard layout. Here you consider the layout, hence key codes are layout-dependent. As discussed before the scancode for the “Z”-key on a German keyboard will return that the “Y”-key has been pressed since the key has the location of the “Y”-key of an US keyboard. But the key code will not return it is the “Y”-key but it will correctly return that the “Z”-key has been pressed. The red marked output in the following image illustrates the result if the”Z” key is pressed on a German keyboard. Use SDL_KEYDOWN to treat the keyboard like a 101-button joystick now. Text input comes from somewhere else. Think of the famous T-shaped WASD key arrangement (arrangement of the four keys “W”, “A”, “S” and “D”) in the US layout, even if you keyboard without any latin letters, you may want to use these four keys to move a game character forward (“W”), left (“A”), backward (“S”) or right (“D”). The labeling of the keys doesn’t matter in that case and the keys are not used to input some text. The unicode field is deprecated and will not be discussed here. By the way, also procedure SDL_EnableUnicode is gone, which turned on the unicode mode. Let’s have a look in the next part of the code and learn about the correct text input in SDL 2.0. With SDL 2.0 there is a new event type named SDL_TEXTINPUT. This one has been explicitly introduce to SDL 2.0 to make text input more flexible and easy. Let’s have a look into the record structure of SDL_TextInputEvent. In contrast to the event structure SDL_KeyBoardEvent where two event types (SDL_KEYDOWN and KEYUP) were available, at the moment for the event structure SDL_TextInputEvent only one event type, SDL_TEXTINPUT, is possible. The timestamp and windowID field have been discussed earlier in great detail. They contain some general information about when this event was triggered and which application window had the focus when the event was triggered. You may scroll up to get more information about this. Unique about this event structure is the field text which is an array of char elements. This array contains from 0 to SDL_TEXTINPUTEVENT_TEXT_SIZE char elements. SDL_TEXTINPUTEVENT_TEXT_SIZE has a size of 32 by default. Attention here, this doesn’t mean you can only have 32 characters in texts or something like this! It means that in the moment this event is triggered not more than 32 characters are submittable to the event. Keep in mind though, if you use a Western language with Latin characters you always only submit one chracter at a time by each key stroke. to access the text input information. In the first line of the code we simply print out the content of the text field. The string variable “text1” is used to store the found character and add to the characters which have been found before. This string is also printed out. Note how special characters (e.g. currency symbols, French accent symbols, the German “ß” symbol, …) and capital letters are recognized correctly. Try this with key codes or scancodes (it is a pain). Note also that function keys ( F1, Backspace, …) are not recognized as characters. It is your responsibility for them to work the desired way :-). Now an awesome feature of SDL 2.0 will be presented which is fixing a big major problem for many programmers. It concerns the resolution of the application or game. If you create a game, often there are a lot of questions you just can solve partly by planning. The main question is: What exact resolution are the users going to use to play the game? Do their monitors support the resolution you decide for? Do the user/gamer use a wide screen monitor? And so on. Depending on the answers to these questions you may choose for sprite/image file resolutions. If you are going for a target resolution of 640 x 480 (VGA), you will choose less detailed source images as if you go for 1024 x 768 (XGA), or even widescreen 1680 x 1050 (WSXGA+) or any other high detail resolution. If every monitors/graphic boards would be capable of displaying all possible resolutions, this wouldn’t be much of a problem. The system would just switch to the necessary resolution and voila the game is running and looking like expected. Unfortunately though, you cannot expect a system whose maximum resolution allows for XGA to display WSXGA+ resolution. Also, even if the system is capable of displaying very high resolutions, there is no guarantee that it will be able to switch down to VGA resolution. Furthermore, if you optimize a game for VGA resolution, you will choose the sprites/images according to fit into a 640 x 480 pixels screen. Lets say you are doing a racing game. You choose a car image of 64 pixels width and 32 pixels height. This fills a good amount of the screen in VGA resolution. In WSXGA+ resolution the car’s width and height will appear less than half, it will appear to be tiny. SDL 2.0 provides a solution to circumvent many of the troubles related to resolution settings: the logical resolution. program SDL_LogicalResolution; uses SDL2; const Border: TSDL_Rect = (x: 0; y: 0; w: 640; h: 480); Quarter: TSDL_Rect = (x: 320; y: 240; w: 320; h: 240); var sdlWindow1: PSDL_Window; sdlRenderer: PSDL_Renderer; begin // initilization of video subsystem if SDL_Init(SDL_INIT_VIDEO) < 0 then Halt; if SDL_CreateWindowAndRenderer(0, 0, SDL_WINDOW_FULLSCREEN_DESKTOP, @sdlWindow1, @sdlRenderer) <> 0 then Halt; // set scaling filter SDL_SetHint(SDL_HINT_RENDER_SCALE_QUALITY, 'linear'); // set logical resolution if SDL_RenderSetLogicalSize(sdlRenderer, 640, 480) <> 0 then Halt; // draw red border SDL_SetRenderDrawColor(sdlRenderer, 255, 0, 0, SDL_ALPHA_OPAQUE); SDL_RenderDrawRect(sdlRenderer, @Border); // draw green quarter SDL_SetRenderDrawColor(sdlRenderer, 0, 255, 0, SDL_ALPHA_OPAQUE); SDL_RenderDrawRect(sdlRenderer, @Quarter); // render to window for 3 seconds SDL_RenderPresent(sdlRenderer); SDL_Delay(3000); // clear memory SDL_DestroyRenderer(sdlRenderer); SDL_DestroyWindow (sdlWindow1); // closing SDL2 SDL_Quit; end. This program basically draws two rectangles, a red one and a green one. They are defined by these constants. 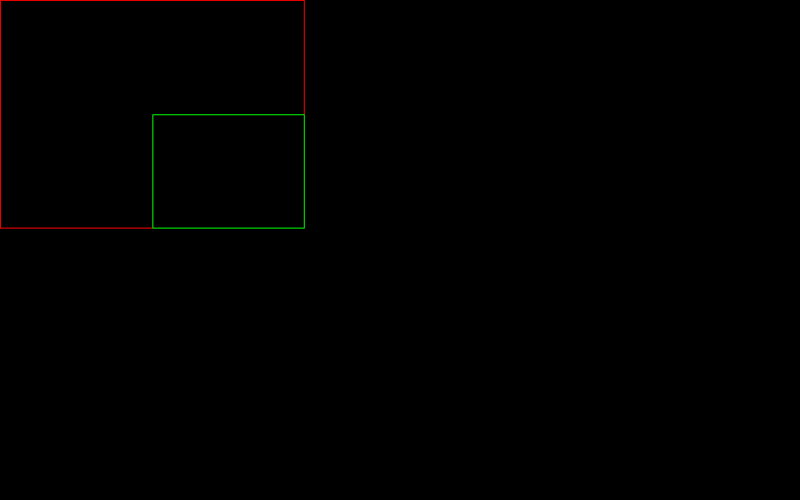 This is the expected result if your monitor has a resolution of 1680×1050 px, and you render a red rectangle at position (0/0) width dimension 640×480 px, and a green rectangle at position (320/240) with dimension 320×240 px. This is the result on a 1680×1050 px monitor resolution, if a logical size of 640×480 px is used. Notice the black border (letter boxing) to the left and right of the red rectangle, because of the different aspect ratios, 16:10 (monitor) and 4:3 (640×480 target resolution). 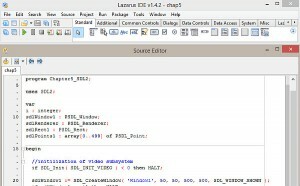 How does SDL2 achieve a Logical Resolution? Although your monitor resolution may be much larger (e.g. 1680×1050 px) than what your program is expecting (640×480 px), SDL2 will scale everything up or down just to fit your real resolution the best! The function SDL_RenderSetLogicalSize() is used to achieve a logical resolution and returns 0 on success and the negative error code on failure. SDL_RenderSetLogicalSize(renderer: PSDL_Renderer; w: SInt32; h: SInt32): SInt32. It sets a device independent resolution for rendering. It will make use of scaling functions internally to fit the target resolution to the actual screen/device resolution. If you want to display a game in VGA (640 x 480) resolution on a XGA (1024 x 768) resolved screen, SDL_RenderSetLogicalSize() will scale up everything as necessary to fill the screen. Even if the ration of the device is different, for example you are trying to have a 4:3 ratio resolution on a wide screen 16:9 monitor, this function will just put some bars at appropriate places (see screenshot above) and fit the targeted resolution to the device resolution as good as possible. This is demonstrated in the example code. A target resolution of 640 pixels width x 480 pixels height (4:3 ratio) should be achieved in a device (window) of width x height of 1680 x 1050 pixels (16:10 ratio). Back to the code. Fullscreen rendering at desktop resolution is achieved by the SDL_WINDOW_FULLSCREEN_DESKTOP flag. And then the logical size is set as discussed by SDL_RenderSetLogicalSize(). By the way, it is strongly recommended to set the scaling filter (SDL_SetHint()) to a better quality filter, because heavy scaling is done behind the scenes by SDL_RenderSetLogicalSize(). Actually that’s it :-), everything else, drawing and rendering rectangles and cleaning up memory is known to you.